Are you tired of all the imports and mass produced products from overseas? 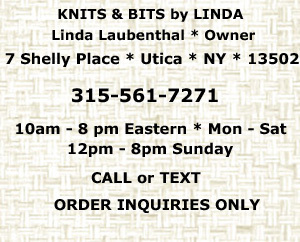 The items you will find here at Knits & Bits by Linda are all handcrafted in New York State. We have a large assortment of items for you to choose from. We have some hard to find items for your kitchen and bath. Adorn yourself with one of our unique designer fashion scarves. And be sure to check out the Christmas stockings where you will find a huge variety of color combinations to choose from. Welcome to our store. Browse our many departments to find that "just right" gift for your loved ones or a treat for yourself. Cut off date for Christmas delivery every year is Nov 1st. Please read the "Notice" page. Hand made by Linda in the USA, in a smoke-free, pet-free environment. For your home decor we have hand crocheted or hand knit afghan Lap Throws perfect for Nursing Home residents or those confined to a wheelchair. And who doesn't need a Hanging Kitchen Hand Towel? We have them in a large variety of styles and colors; prints, solids, plaids, stripes and seasonal. We have a page of Towel Gift Baskets. For the kitchen and bath we also have hand crocheted Nylon Pot Scrubbies. These work great on pots, the sink and bathtub, too! A customer tells us she uses them to scrub the veggies. Maybe you'll find other uses for them? Let us know if you do. We sell spools of the Nylon Netting so that you can make your own. Plus we have crocheted "Rag" Pot Holders and crocheted "Rag" Coasters, a great way to protect your furniture and they are machine washable too! We now have hand knit cotton dish cloths available in a variety of colors with more being added as they get made. We just added new products to our fashion accessories; Cotton Headbands and Head Scarves. How about some ponytail Hair Scrunchies to dress up your lovely locks or add some pizzazz to your little girls hairstyle? Or maybe a Triangle Head Scarf Kerchief? (Sometimes referred to as crocheted “do-rags”) How about a scarf using designer fashion novelty yarns? We have them here in the form of Keyhole Scarves. We also have Full Length Fashion Scarves available. We have one of the largest collections of hand made scarves on the Internet, all made by Linda herself. New styles are being added as she gets them completed. Check out the Decorative Skinny Scarf page for designs sure to please. For Christmas we have Knit Christmas Stockings in many color combinations so everyone in the family can have their own color. These stretchy knitted socks will be a big hit with everyone on your list. New color combos for 2015 will be added soon. We also offer personalized Name Tag Ornaments to attach to the stocking hanging loop. Be sure to check out our personalized Fabric Photo Ornaments! Preserve your favorite photo on one of these unique ornaments. Memories that are sure to last for years to come! These will become favorite family heirlooms. Our families just love them! Our store is filled with quality hand crafted items made especially for you. Many items are one-of-a-kind. Most items are made to order, so please, allow Linda ample time to make up your order. In-stock items ship within a few days. Custom orders may take up to six weeks or more, depending on the item ordered and how many orders are on the "to-do" list. Keep in mind that Linda does all the work on her own. Thank you for understanding. Choose a department from the list in the left navigation panel. The pages are filled with pictures, so the load in time may be a little slow. Please be patient. You'll want to see every one of them! Your privacy is guaranteed. The information you provide us is kept STRICTLY CONFIDENTIAL. It will not be shared with anyone. We promise to NEVER sell, rent or trade your information. Not Ever! American Express, Discover, Master Card and Visa are accepted here. You may choose which one during the check out process. PayPal, Personal Checks and Money Orders are also welcomed. Use PayPal to pay for your purchase. Click on this logo to set up your FREE account today! No need to have an account in order to use PayPal to make your purchases. Linda will send you an invoice from her PayPal acct when the order is completed. You just follow the link in the message to make your payment. Free shipping on all merchandise orders above $100 within the USA before shipping fees. International orders will be shipped International Priority at purchaser's cost. Thanks for clicking in to our little store. Come back again soon! 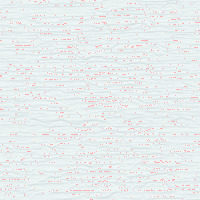 view new items as they are added. Thanks! And have a WONDERFUL day! Please note that we use USPS Priority Mail shipping with insurance & delivery confirmation. Fees are adjusted based on the weight of the packed box and shipping zone of delivery address for all orders over 1 pound.